The other day, I sent a get-well card to my wife's pastor and his wife. When it came time to address the envelope, I was told to make it “Pastor”... etc. This I will not do. (She did not question why I won’t.) I would have told her that I will never again use the addresses pastor, reverend, your eminence, father, Holy Father, and so on. First of all, I ﬁnd nothing to “revere” about them. Second of all, such terms are not appropriate in these United States, any more than Your Majesty or My Lord are. I don't care if the President addresses a catholic cardinal as “your eminence.” He shouldn't. (Right now one of those “eminences” has been charged with covering up for priest pedophiles in California.) Thirdly, consider the history of priesthood and its psychological effects. For the fearful and incurious, priests have exploited the childish belief that an individual’s thoughts, wishes, feelings and fantasies inﬂuence and cause events in the natural world. And the priests assert the same “attributes” to supernatural figures. In reality, despite what goes on in the child or childlike mind, only actions matter. Good and evil are the results, in human relations, of actions alone, not thoughts or desires. In every religion, gods are exempted; neither do morals apply to the gods and their spokesmen, but to underlings designated by the priests. Here's my take on how the priestly system started and evolves, and why it continues to be perpetuated. Once upon a time, either by curiosity or accident, someone had bizarre dreams or stumbled upon a hallucinogenic plant, fungus, or fermented fruit, and ate some of it. Perhaps the person or persons lived above a naturally occurring noxious gas leak in the ground or cave nearby and continually inhaled it. The doors of perception were altered or ﬂung wide open and ”revelations” ensued. That person had access to another ”realm of reality” and revealed some of the revelations to others, unaware of how such “mystical wisdom” and “truth” was acquired. When enough gullible and innocent people listened and believed these soothsayers and their predictions because they were thirsty for explanations, they were hooked in, and priests became very important for their connections to the gods. Over time, exploiting the fears and hopes of their believers, powerful clerical inﬂuences increased and even dominated societies. Wars were fought on their advice, with the sanction and demands of their gods. Sacriﬁces of labor, time, money, were made to guarantee the god’s favors, appease their wrath, and to escape punishment for whatever their spokesmen know offends those gods. In present times this is still tradition, and the gods of the past have been replaced by morphing the present “God” to fit the needs of “His” spokesmen. But it's still the same religio-political combo. Clergy are still telling those in power what the god of their choice wants, even in democracies where those elected to power should be listening to the voices of the electorate instead. Prayers and invocations are still made to a deity in states and the Capitol of the United States, by clergy who know the existence and will of their god as well as their pagan predecessors did their gods, and all of them with the same evidence for their existences. Clergy are consulted in matters of national importance today, as moral authorities and reps of divine favor, just as they have always been, and with reverence, privilege and special access. Clergy hold so much political power today that they have convinced their trusting and gullible followers, as they did in the past, to vote as they are told to. Science has to be the greatest threat to priestly power and prestige with all those rational explanations and evidence to prove that natural disasters are the result of natural forces, for example; tsunamis, earthquakes, blizzards, volcanoes erupting, etc. Think of advances in medicine alone. Viruses and bacteria cause diseases, not sins. DNA, sometimes by heredity, but never by inherited sins, causes physical deformities. Damaged or absent brain cells are responsible for evil actions, delusions, and the gradual disappearance of the soul in dementia and Alzheimer’s disease. FMRI scans show us the effects of meditation, drug interactions, delusions, and poisons on the brain. With science we can electrically cause “out-of-body” experiences. (Why, even placebos have been shown to be as effective as prayers.) There are evolutionary explanations for just about everything in living things, and more are being discovered each hour. All the traditional “reasons” to maintain respect for clergy are not there anymore, because they were based not on knowledge, but ignorance. Even “things that go bump in the night” aren’t frightening and in need of priestly interpretations anymore. Their authority and power are threatened by scientiﬁc facts. Science (“scientia” means “knowledge”) teaches that knowledge is power. 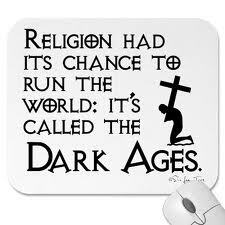 Religion “teaches” that ignorance is bliss. One is liberating and fright-dispersing, and the other depends on fear and the refusal to go where one is not supposed to go as ordained by the god or gods. Science goes there, while clergy recapitulate superstitions of the past and get the powers that be to bow down to them. One ﬁnds answers; the other makes them up. One brings humankind out of needless fears; the other creates them and exploits those already there for its own parasitical survival. Those great priests of tradition are become placebo dispensers and entertainers. Some of them have become buffoons for our ridicule and disgust.